Billie Kopec with Girrawheen/Koondoola Senior Citizens Club president Terry Todd and treasurer Deanne Hetherington, Wanneroo Councillor Brett Treby, Girrawheen MLA Margaret Quirk, Mayor Tracey Roberts and Cr Domenic Zappa. SENIORS can get a whole body workout on outdoor fitness equipment for seniors installed at a Darch park recently, from step ups and body twists, to chest and leg presses. The free-standing exercise equipment at Monaghan Park was designed to help improve balance, flexibility and mobility for seniors as well as other people with limited mobility. Wanneroo Mayor Tracey Roberts said several sites in Darch and Madeley were considered as possible locations for the equipment. “Monaghan Park was selected as the most suitable location due to availability of parking, pathway connections throughout the park and surrounding streets, in addition to its proximity to public transport, the Darch Plaza and Darch Medical Centre,” she said. Other features at the park include a bench, shade sails and a footpath. 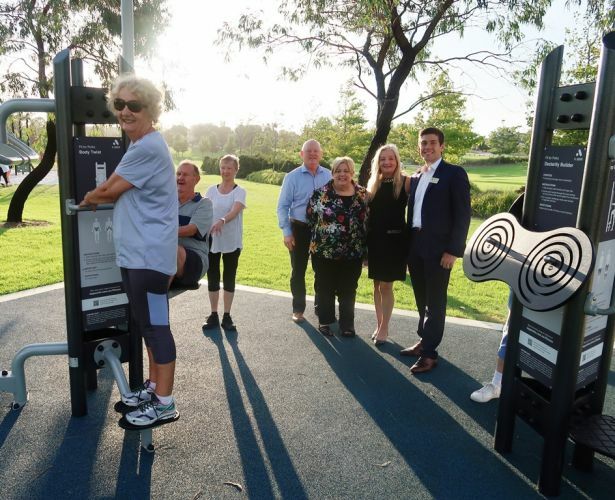 The exercise equipment and other upgrades, including a bench, shade sails and footpath, cost $81,000, including a $61,000 grant from the State Government’s Local Projects, Local Jobs program. Girrawheen MLA Margaret Quirk said the project was a first for the northern suburbs. Mrs Roberts said the City of Wanneroo was considering the installation of security lighting at Monaghan Park to improve community safety and reduce anti-social behaviour as a result petition received in 2018. Public consultation on separate concept plans for a seniors’ fitness park at Bert Togno Park on Civic Drive in Wanneroo closes today.